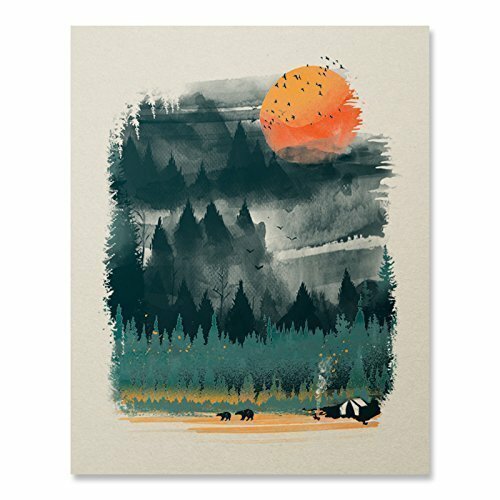 This beautiful wilderness wall art is printed using some of the finest inks and includes the following colors: Light Green, Dark Green, Orange and Yellow. It is printed on 80# coated paper and has a matte finish. The actual paper size has dimensions of 8" x 10". This sunsetting forest print is a great gift for all nature lovers and comes packaged in a clear plastic sleeve and supported with a cardboard backing. It is then shipped using a rigid kraft photo mailer envelope to ensure safe travels during transit. All of our wall decor is printed in the USA and looks great in all types of environments. Whether its displayed in your office, living room or even a child's bedroom, these art prints are sure to be enjoyed for years to come and make great conversation pieces. If you have any questions about this product by Fuzzy Ink, contact us by completing and submitting the form below. If you are looking for a specif part number, please include it with your message.